LEXINGTON, Ky. (Sporting Alert) — No. 1 Kentucky survived the early push from Buffalo en route to a 71-52 victory at Rupp Arena on Sunday. Tyler Ulis scored 12 points after hitting 4 of 5 three-pointers and dished out six assists, while Trey Lyles, also went 4 of 5 from the field for 12 points, four rebounds and three assists for the Wildcats, who rallied from a five point halftime deficit. Devin Booker added 10 points off the bench for Kentucky (2-0), who shot 41 percent from the field on 25 of 61. The Wildcats out-rebounded Buffalo 46-27, including 19-7 at the offensive end. Jarryn Skeete and Rodell Wigginton combined to score 31 of the Bulls’ total points. Skeete finished with 16 points on 6 for 8 from the field, including 4 of 6 from three-point range, while Wigginton collected 15 points in the defeat. 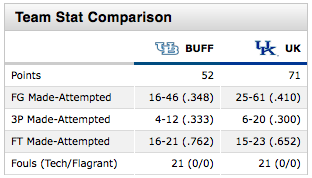 Justin Moss and Lamonte Bearden each scored eight-points for Buffalo, who led 38-33 at halftime. Both teams were even 23-23 with 9:05 left in the first half, before the Bulls used a 15-10 run to take the advantage at the break. Dakari Johnson grabbed 12 boards, nine points, four blocks and three assists and junior forward Willie Cauley-Stein collected 10 rebounds, six points, four assists and two steals in a balanced afternoon offensively for Kentucky. Justin Moss and Lamonte Bearden each score eight-points in the defeat for Buffalo. Next up for the top ranked Kentucky is an early clash with No. 5 Kansas on Tuesday in Champions Classic. Buffalo will play at UT-Arlington on the same night. In Madison, No. 3 Wisconsin scored an 89-45 victory over Chattanooga and improved to 2-0 to start the season. Sam Dekker collected 18 points and four rebounds and Frank Kaminsky and Nigel Hayes both grabbed double-doubles on the afternoon for Wisconsin, which never trailed in the contest and scored 24 points before Chattanooga went to double digits as a team. Hayes scored 15 points and pulled down 13 rebounds, with Kaminsky finishing with 15 points, 10 boards and four helpers for the Badgers, who scored 52 points in the first half alone. Ronrico White had 15 points in a reserve role, Casey Jones added 12 and Justin Tuoyo ended with 11 forChattanooga.